Deputy Mayor David Elms had his work cut out, not only did he open the event but also took part in the woodworking workshop and observed Wendy making the FOSL draw. The stalls saw a brisk business all day and it was great to have the Spike WI presenting their wares. And when they weren’t dancing the were showing visitors Chinese art. The Tea Room was also busy especially with people coming in to cool down out of the sunshine. Punch and Judy were again a star attraction but with the wind picking up, the last show had to take place in the Education Suite. Not quite the same atmosphere as watching it on the beach! 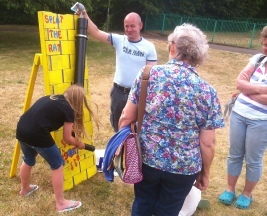 Splat the Rat another popular seaside past time! 28th July 2013, a sunny but very windy day saw the second Seaside Extravaganza in St Luke’s Park.